In August of 2013, the Town of Maynard utilized state grant funding to install its first electric car charger for public use. This project was made possible through Maynard’s participation in the Massachusetts Green Communities Program. As a member of this program, Maynard has committed itself to reducing municipal energy consumption by 20%. Guardian Energy Management Solutions assisted the Town of Maynard in the selection and installation of the new electric car charging station. “I was trying to create a milestone that other Green Communities would follow. Together, we can reduce our carbon footprint, and hopefully one day we will create a roadmap listing all of the public electric car chargers within Massachusetts,” said Greg Lefter, Town Facility Director and project spearhead. 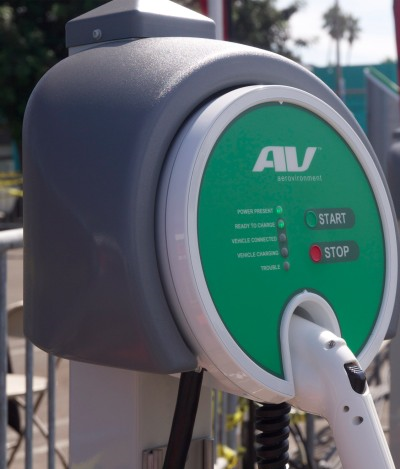 The charger is located across from Veteran’s Memorial Park (12 Summer Street), and is free to use in an effort to motivate community members to rely less on gas. It is a product of AeroVironment, Inc. a leading manufacturer of energy efficiency products. Guardian is a certified installer of AeroVironment’s Electric Vehicle Solutions in Massachusetts. For more information on how your town can become member of the Green Communities Program, visit http://www.mass.gov/eea/energy-utilities-clean-tech/green-communities/. Guardian Energy is a vendor of National Grid and NSTAR, as well as a leading energy efficiency consultant for towns seeking to qualify for the Green Communities Program; Guardian is currently working with over three dozen municipalities in Massachusetts that participate in the Green Communities program. For additional information on Guardian’s energy management products and services, companies can visit http://www.guardian-energy.com. Guardian Energy Management Solutions provides energy-efficiency products and services for commercial, industrial and municipal customers that are designed to help contain, lower and control utility expenditures. Located in Marlborough Massachusetts, Guardian Energy Management Solutions works with energy-conscious organizations to save on energy costs, qualify for utility rebates and meet greener standards.